A few commenters have pointed out that my previous post on the calculations for the Opal card system is wrong. I apologise for the miscalculation and yes, it is wrong. I based my research on the information provided by the official Opal and Transport NSW website. Unfortunately as it turns out, the information on there was confusing and hard to understand. 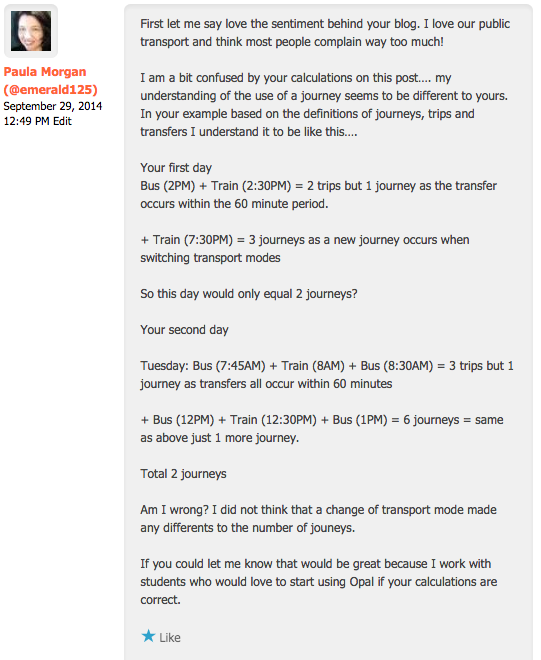 Paula from Sydney Expert has kindly explained the right way to calculate my trips and journeys for using the Opal card. Well like many other people, I was stumped by the use of the three terms: trips, journey, transfer. I just couldn’t comprehend the differences and how a trip turned into a journey if I were to transfer between a bus and train and back to a bus again. After publishing my post, I met with the Opal kiosk workers at my station and asked them to explain in detail how the card system worked. Their explanation was confusing and gave me no further insight aside from the fact that it would still be cheaper for me to purchase a MyMulti2 as the concession Opals have yet to be released. I find it astounding that they have yet to roll out the concession Opals as I know dozens of students who would love to use the cards as well. Why are there child Opals when they receive free transport to and from school regardless … but there aren’t concession Opals for students that are paying for tickets on a daily/weekly basis? I am by no means an expert on Opal, so I do apologise for the miscalculations. For a more comprehensive post on how the Opal system works including discounts, registration and explanation of terminology, please visit Paula’s post on Opal 101. This entry was posted in Information and Facts and tagged city rail, journeys, love your trains, loveyourtrains, nsw transport, opal card system, opal cards, opal terminology, positive sydney, sydney, trains, transfers, transport, transport for nsw, trips. Bookmark the permalink. ← Call-to-action: Stop whinging, Sydney. It’s unbecoming. High school and university concession cards are given out at the start of the year with student cards. Concession Opal cards will probably be rolled out at the start of the 2015 academic year, by when the Opal rollout should have concluded. However, this has not been officially announced and is only an open secret at this point.